Western blot analysis of whole cell lysates probed with CD326 antibody (VMA00193) followed by detection with HRP conjugated Goat anti Mouse IgG (1/10,000, STAR207P) and visualized on the ChemiDoc™ MP with 60 second exposure. Arrow points to CD326 (molecular weight 40 kDa). CD326 antibody recognizes epithelial cell adhesion molecule (EpCAM), also known as adenocarcinoma-associated antigen, cell surface glycoprotein Trop-1, epithelial glycoprotein 314 or major gastrointestinal tumor-associated protein GA733-2. Mouse anti Human CD326 antibody recognizes CD326 also known as epithelial cell adhesion molecule (EpCAM), adenocarcinoma-associated antigen, cell surface glycoprotein Trop-1, epithelial glycoprotein 314, human epithelial glycoprotein-2, major gastrointestinal tumor-associated protein GA733-2, membrane component, chromosome 4, surface marker (35kD glycoprotein) and tumor-associated calcium signal transducer 1. Encoded by the EPCAM gene, CD326 is a carcinoma-associated antigen and a member of a family that includes at least two type I membrane proteins. This antigen is expressed on most normal epithelial cells and gastrointestinal carcinomas and functions as a homotypic calcium-independent cell adhesion molecule. The antigen is being used as a target for immunotherapy treatment of human carcinomas. Mutations in EPCAM result in congenital tufting enteropathy (provided by RefSeq, Dec 2008). 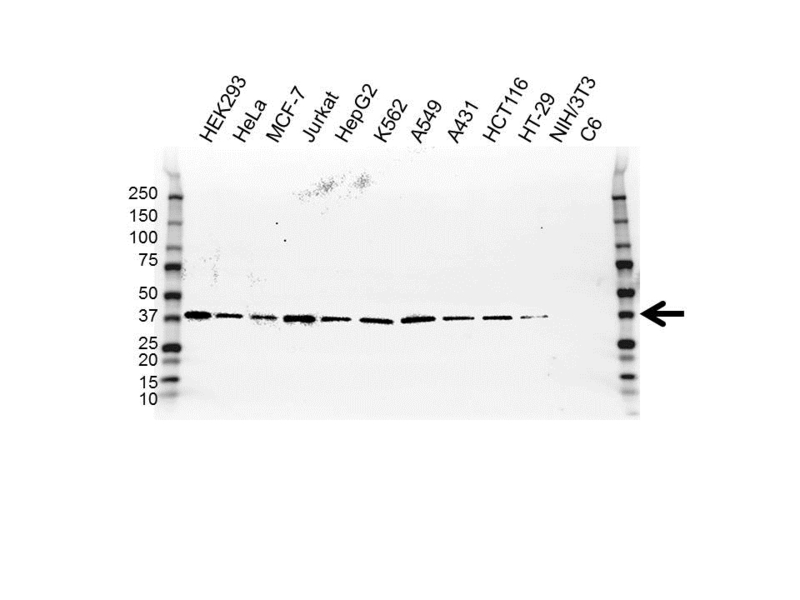 Mouse anti Human CD326 antibody detects a band of 40 kDa. The antibody has been extensively validated for western blotting using whole cell lysates. Anti CD326 detects a band of approximately 40 kDa in HEK293 cell lysates.